Do limits on after-hours e-mail reflect French culture’s laziness or American culture’s malaise? Last week, a dazzling meme captured the viral hive-mind of an overstressed generation: French workers had adopted a new labor policy to ban work-related e-mail after 6 pm. In a half-jeering, half-envious tone, commentators trumpeted France’s hardline defense of living well and “life after 6 p.m.” You could almost hear the champagne glasses clinking at the strike of six as Vuitton-clad employees powered down their mobiles in lockstep and promptly flipped off the supervisor. In reality, France’s off-clock life remains essentially unchanged. The image of legions of French office grunts downing smartphones en masse was, alas, slightly hyperbolic. As Buzzfeed and others pointed out, this was not a law, but something known as a “labor agreement.” On behalf of a group of organized professional employees, the CFDT (Confédération française démocratique du travail) and CGC (Confédération générale des cadres) unions engaged employer’s associations via collective bargaining and agreed to an “obligation to disconnect from remote communications tools” outside of normal working hours, which professionals measure by days worked annually (no set hours, much less a post-6 pm ban). The measure, aimed at preserving workers’ health and wellness, now awaits approval by the Labor Ministry. The agreement covers mid-managerial professionals whose schedules tend to be more erratic—or what corporate America terms “flexible.” The 250,000 affected employees represent some of the most stressed-out “knowledge economy” workers, and the labor arrangement simply aims to limit stress by placing some restrictions to how much work intrudes on the personal lives of workers. Besides, France’s famous thirty-five-hour workweek does not apply to these workers, and they are generally allowed up to seventy-eight work-hours in a given week—hardly a life of leisure. And the policy is not unprecedented. The German Labor Ministry and Volkswagen’s administration have recently enacted similar curbs on after-work contact between staff and higher-ups. More curious than the e-mail proposition was the grossly inaccurate media portrayal—echoing a time-honored tradition of deriding the French as effete snobs on the one hand, and retrograde European welfare spongers on the other. The trope of the atrophying welfare regime has long played opposite the can-do vigor of American-style capitalism. And yet, the pathos of la belle vie has not stopped the OECD from ranking France among the most “productive” countries in terms of GDP per hour worked. And according to 2011 data, the French actually work about forty hours per week, despite the thirty-five-hour limit—somewhat below Germany but about comparable to the EU average. From a historical standpoint, America is the outlier. As The New Yorker reports, during the last century, working hours declined on both sides of the Atlantic. But as neoliberalism crystallized in the 1980s, “Europe consolidated its generous welfare state, and the US, under Ronald Reagan, began dismantling its own in the name of making its economy more competitive.” And American work schedules have accelerated toward an ever-more feverish pace (even as actual earnings sag). While unapologetically suckling from the state’s teat, French workers also benefit from fiscal stimulus at a high rate, with some 240,000 jobs directly generated by government in 2011. Of course, some Americans may recoil at such Keynesian interventionism. But from a labor standpoint, this demonstrates the maintenance of the state’s essential role in safeguarding workers from the volatility of the Eurozone crisis—a crisis that, while certainly disrupting France’s economy, is also a product of the very same breakneck “growth” that free-marketeers tout as the solution. The fundamental difference between French and American work cultures lies in collective consciousness. French workers saw about 700 work stoppages, including strikes and lockouts, in 2004 (the last year for which official data is available), compared to less than 140 for the Brits and a piddling seventeen for Americans. 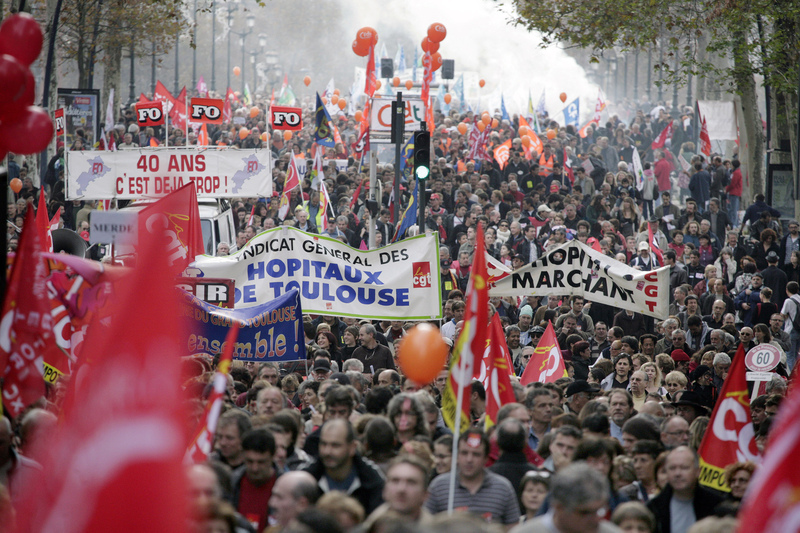 French labor’s militancy, not sloth, is likely the true source of Titan’s scorn. Taylor’s missive grumbled about “the crazy union” for rejecting the firm’s attempt to cut hours and ultimately refusing to negotiate on job cuts, leading to a breakdown of contract talks in 2011. So the French workforce was hardly lazy about defending what mattered. Yet French labor is fighting a war of attrition, and the new e-mail rules reveal that the professional class is on the defensive. As in the United States, hypercompetitive, 24-7 startup culture is driving France’s white-collar workers toward that all-too-familiar obsessive, lethal workaholism. For France’s ordinary proles, the labor conflicts of the past few years have not ended with mutual agreement. Last year, controversy erupted over a proposal to loosen the six-day workweek rule. Street protests roiled over plans to weaken labor protections that shield workers from being sacked—a move designed to enhance “flexibility” in the labor market. That French workers still cling to what’s left of decades of labor struggles may invite ridicule from American counterparts, but the laughter masks a latent unease, perhaps yearning. Alongside the newsfeeds spitting headlines about France’s zany e-mail ban, how many articles fret over waning work-life balance, or recommend techniques for “self-care,” meditation or even the modern rite of “unplugging.” These faddish self-help tactics suggest workers’ internalization of bone-crushing stress, viewing it as an individual flaw to “cope with,” rather than a larger social problem. Now some French workers have developed a modest proposal to manage stress. Is that the nanny state or human reason at work? Bottom line: workers on both sides of the pond recognize the finer things in life, but only one society is still bold enough to demand a little civilité as policy, not just a perk.